Classic in look and design, these 4’x4’ panels offer a simple beauty with their mottled, granite-looking surface texture. Each panel comes with handholds, mounting hardware, and an installation manual. Nicros-GranitPanels™ are the highest quality, lowest price per square foot climbing wall system available. Nicros-GranitPanels™ are plywood sheets covered with a special granite-like climbing texture and can easily be added to an existing wall (or framework) to create a wall of any width or height. Each panel has 32 screw-in T-nuts which will leave you with endless possibilities for routesetting. Appearance. Nicros-GranitPanels™ are 4’x4’ plywood sheets covered with a special granite-like climbing texture. GranitPanels™ are available in 12 different colors and can be painted with a custom mural to enhance the look and appearance of your climbing wall. Versatility. Nicros-GranitPanels™ are the highest quality, lowest price per square foot climbing wall system available.The beauty of these panels is that they can be installed virtually anywhere and are used to create a vertical climbing wall or a bouldering wall. A climbing wall made from Nicros-GranitPanels™ is a fun addition to any recreation center, school, camp, rehabilitation center, etc. Feel. Nicros-GranitPanel™ texture is the best in the industry, you won’t find a better texture in any paint-on product. The granite-like texture is gritty enough to get awesome traction while still remaining flat enough that holds can be firmly tightened down flush with the wall. These panels do not have an abrasive, skin-shredding texture to the climber who slips off while climbing. Durability. Unlike other paint-on textures, Nicros-GranitPanel™ texture utilizes a special spray-on process that makes it tougher, stronger, more uniform and allows it to bond to the plywood better than in other paint-on products. Design. Classic in look and design, these panels offer a simple beauty with their mottled, granite-looking surface texture. Nicros-GranitPanels™ can easily be added to an existing wall (or framework) to create a wall of any width or height. Each panel has 32 screw-in T-nuts which will leave you with endless possibilities for routesetting. Handholds. Each panel comes with five handholds to get you started. Nicros has over 1,500 handhold shapes to customize your wall. The holds generally come in a combination of “kid-friendly” colors such as red, blue, green, yellow, or orange. If you have a specific color combination you are looking for or want your holds to blend in with the background wall panel color, holds can be ordered in any custom color. Check out the Nicros Handhold Store for our complete line of handhold products. Once support framing (i.e. 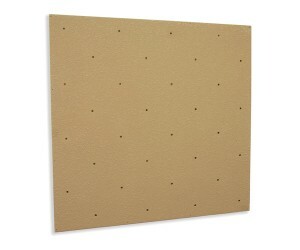 2”x4” wood studs) is put in place, these sheets are easily attached, creating a fun-to-climb textured wall. These panels can easily be cut to create openings for light switches, wall receptacles, etc. before the panel is screwed in place. If you’re unsure or you lack the expertise, please seek professional assistance. If you would like Nicros to install your Nicros- GranitPanel ™, please contact one of our sales representatives at 800-699-1975 for a quote.